The Hubble Space Telescope Advanced Camera for Surveys imaged Aristarchus crater and nearby Schroter's Valley rille on Aug. 21, 2005. The Hubble images reveal fine-scale details of the crater's interior and exterior in ultraviolet and visible wavelengths at a scale of approximately 165 to 330 feet (50 to 100 meters) per picture element. Aristarchus crater is 26 miles (42 kilometers) in diameter and approximately 2 miles (3.2 kilometers) in depth, and sits at the southeastern edge of the Aristarchus plateau. The plateau is noted for its rich array of geologic features, including a dense concentration of lunar volcanic rilles (river-valley-like landforms that resulted from the collapse of lunar lava tubes), source vents, and volcanic materials that erupted in giant explosive events. 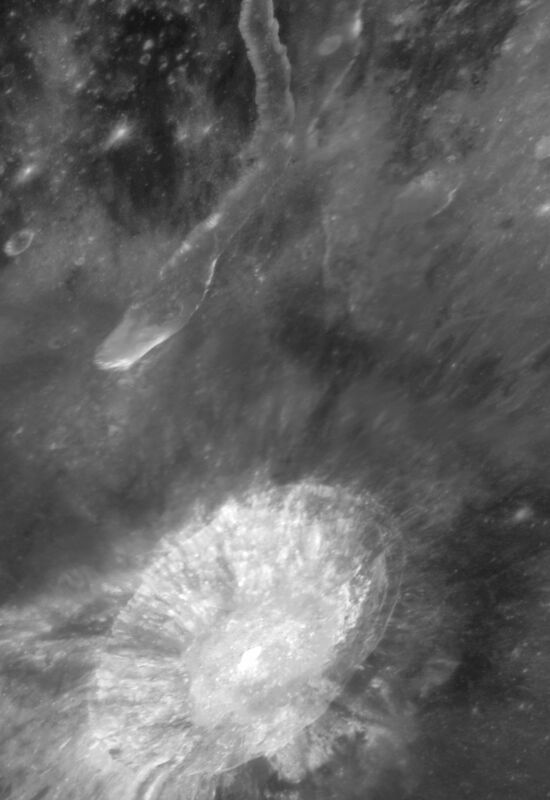 Aristarchus is one of the youngest large craters on the Moon. It probably formed between 100 and 900 million years ago. This composite image shows that many of the crater's fresh impact features are still well preserved, including a sharp rim, inner crater wall terraces, central uplift structures, and a pattern of excavated and ejected materials, known as ejecta, which blankets the nearby surroundings. This spectacular Hubble image reveals the diversity of ultraviolet- and visible-light signatures of crater ejecta, interior wall deposits, central peak materials, and those of the surrounding plateau.